My trusty hardtail Giant. 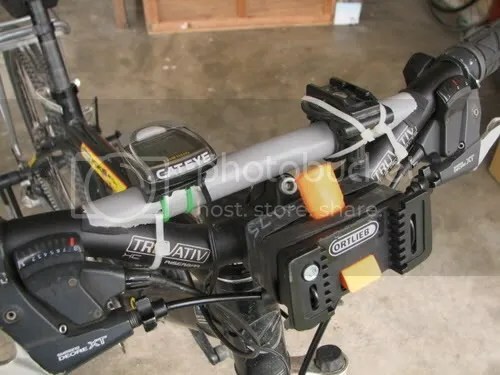 Although it’s not a true tourer, it has served me well since I started using it for touring in 2002 when I rode from Kota Kinabalu to Sandakan. 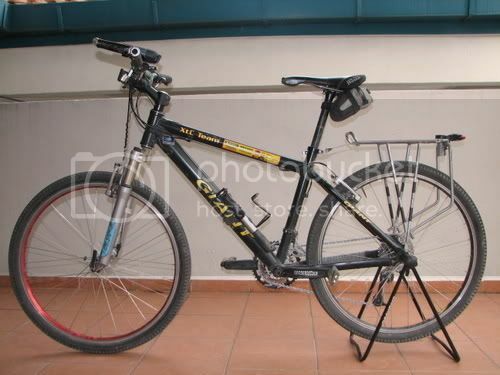 However, I am on the lookout for an old steel MTB, one that sports a straight top tube and threaded handlebar stem. Steel has feel. Another reason for choosing an MTB is the wheel size. 26″ rims, tubes and tyres are easy to find anywhere in the world; even in the most remote parts of third world countries. A few months earlier, before I headed off to Hanoi to begin my Vietnam/Laos tour, I made some changes to the bike – mostly the cockpit. I changed the straight bar to a downhill bar, as well as a higher-angled stem. The objective was to make the front higher which meant a more relaxed riding posture. I shaped a short length of 1" PVC pipe to fit the curve of the handlebar. To hold it all together, I simply used assorted cable-ties; green, black, white - whatever was available in my toolbox. The contraption in front is the Ortlieb handlebar bag holder. 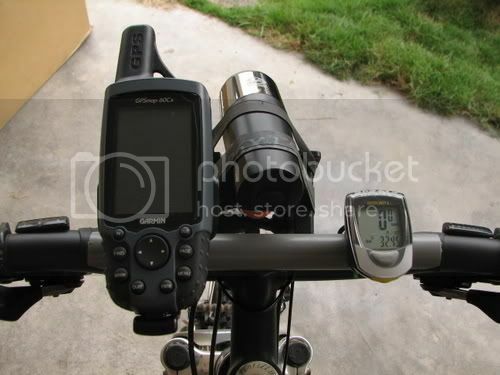 The fully installed cockpit - Garmin 60CX, Cateye LED light (I simply tied 2 rubber-bands of old tyre tube round the handlebar bag holder and slip the light in), and cyclocomputer. I could watch Schldnier’s List and still be happy after reading this.